WORCESTER, Mass. – When Franklin took on Springfield Central at the DCU Center in Worcester a year ago, Chris Edgehill scored eight points in 20 seconds to tie the game and lead the Panthers to an overtime win to clinch a berth in the state championship. This year, when the two teams met again on Thursday night, no such heroics were needed. Franklin played a near-perfect game en route to a 62-43 win over the Golden Eagles, handing Central its first loss of the season. “This game was a little bit more comfortable than last year, we were watching guys cry as we put ourselves together to come back and win last year, so this game I thought we had a much more complete performance from start to finish, I was pretty confident in what we were doing out there,” said Franklin coach CJ Neely. Franklin started out the game on a 15-4 run and finished the first quarter up 21-10 behind two threes from Matt Elias (14 points) and a strong start from senior Paul Mahon, who had eight of his ten points in the first frame. Elias hit another just under a minute into the third quarter, putting the Franklin crowd into a frenzy. “The threes early were great, he’s been big for us all year, and he kind of hit a slump for a couple games and wasn’t spacing the floor the way he has been, and I think that’s what opens things up for Chris [Edgehill], and hitting those early gave him a lot of confidence,” Neely said on the early threes from Elias. Springfield Central chipped away at the Franklin lead in the second quarter, behind Levi Grady-White (12 points, three rebounds), who came off the bench to give the Golden Eagles a spark with eight points in the second quarter. With just over three minutes left in the second quarter, Elias, who had already hit three trifectas for Franklin, looked to take an elbow to the head and was removed from the game. He would miss the rest of the quarter, but returned to start the second half. Springfield Central would go on a 7-1 run with Elias out of the game, cutting Franklin’s lead to six at 29-23 heading into the locker room at halftime. To start the third quarter, Grady-White and Jalen Samuels (13 points, eight rebounds) traded baskets, but after Grady-White cut the lead to four with 5:38 left in the third quarter, Edgehill buried a three from the corner to put Franklin up 34-27. “The shot looked off honestly, shooter’s bounce is what they call that, but definitely whenever I’m hitting shots I’m always gaining confidence, and my team gains confidence in me,” Edgehill said. That confidence was on full display, as after being called for a charge, Edgehill (18 points, four rebounds, six assists) had a beautiful spin in the lane and finished with a layup for two points that extended Franklin’s lead to 36-27. A putback by Samuels with just under a minute left in the third quarter put Franklin up 42-30, a lead they held until the fourth quarter. Springfield Central opened the fourth with a 6-0 run that included a three from Josiah Green (nine points), and a bucket from Anthony Kelley (nine points), who spent most of the game battling foul trouble. With Franklin holding onto a six-point lead, Elias struck again from beyond the arc to put Franklin up 45-36. The Panthers didn’t look back from there, closing the game on a 17-7 run to finish off a 62-43 win and to clinch a berth to the MIAA Division 1 State Final for the second year in a row. 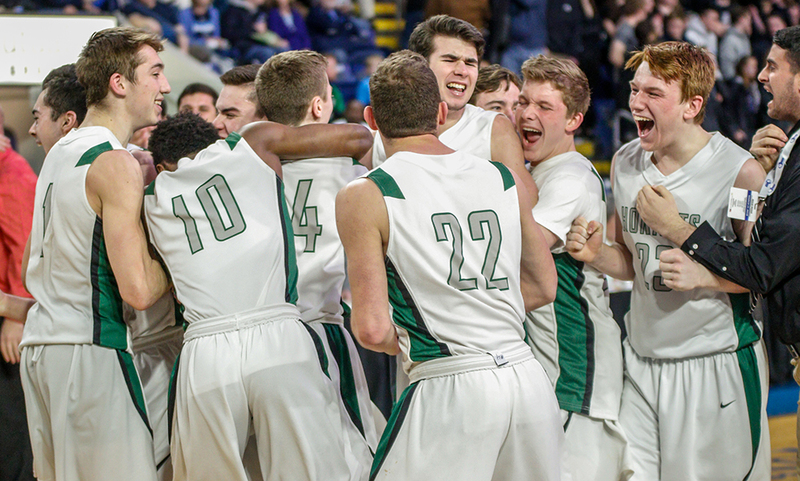 When they arrive at the MassMutual Center on Saturday night for the state final, it will be a familiar face on the opposite bench, as the Panthers will take on the Mansfield Hornets for the third time this season to renew their rivalry on the biggest stage yet. “That’s going to be a great game, knowing our fans are huge and their fans are huge, it’s going to be a great environment,” Samuels said about facing Mansfield for the third time this season. Mansfield’s (26-2) road to the state final this year included wins over Newton South, BC High, Newton North, Brockton, and Everett. Franklin boys basketball (23-3) beat Lincoln-Sudbury, Natick, Algonquin, and Springfield Central on their way to their second straight state final appearance. FRANKLIN, Mass. – In last year’s D1 Central Quarterfinals, Franklin survived a major scare from Acton-Boxboro en route to a 59-52 win. 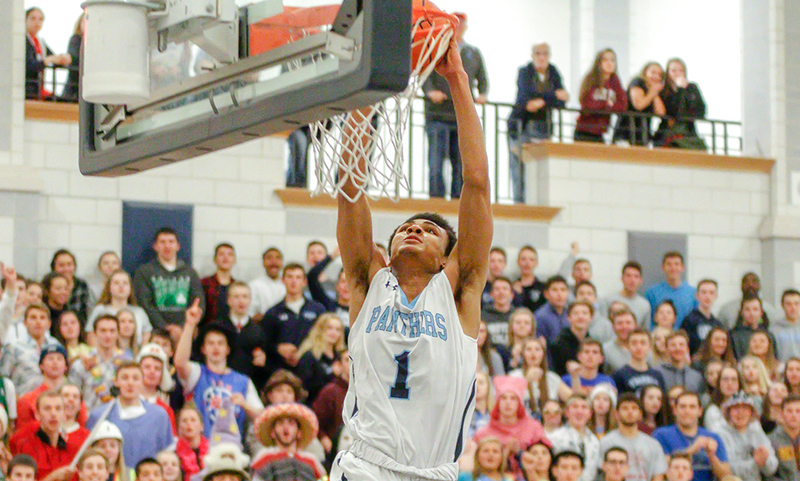 This year, Franklin made sure that scare never came, as the top-seeded Panthers played a near-perfect game from start to finish in a 79-49 win over #8 Lincoln-Sudbury. “This year, we talked about that [the Acton-Boxboro game] at practice and said how you can’t walk in and look at your number one seed and think that’s going to do the job and get you to win games, you have to go out and show why you earned that seed, be the team you have been all season that’s put you in the great position you’re in now, and I thought we did that tonight,” said Franklin coach CJ Neely about his team’s performance. Franklin started the game out on a 10-2 run that included five points from Matt Elias (seven points), but L-S went on a 5-0 run behind threes from Kahmari Williams (11 points) and Jack Sorbo to cut the Franklin lead to 10-8 midway through the first quarter. But Franklin dominated the rest of the half, using a 30-9 run, highlighted by 11 points and three steals from Paul Mahon (19 points, four steals) and seven points off the bench from Will Harvey. The run gave the Panthers a 40-17 halftime lead. Franklin stifled the Warriors defensively throughout the first half, holding them to just 24% shooting in the half and not allowing them to grab an offensive rebound. In the third quarter, Franklin outscored L-S 20-12 with Paul Rudolph (seven points) scoring five points and Jalen Samuels (eleven points, 13 rebounds) chipping in with six points. A three by Rudolph with just under a minute to go in the quarter gave the Panthers a 30 point lead at 58-28, and a layup by Alex Klowan (four points) with 29 seconds left in the quarter extended the lead to 60-28 heading into the fourth quarter. 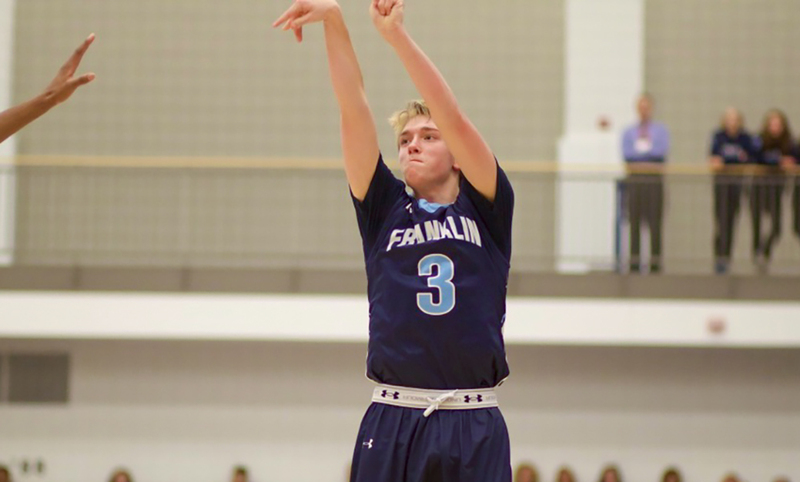 Franklin turned to their bench for much of the fourth quarter, with Gavin Farnan chipping in six points and Jack Rudolph going 4-for-4 at the free throw line. Lincoln Sudbury pulled their starters with just over a minute to go where they got a nice ovation from the visiting crowd. Franklin boys basketball (20-4) advances to the D1 Central Semifinal for the fifth straight season. They will take on #5 Natick at WPI on Sunday at 3:00. The only common opponent Franklin has with the Redhawks is Stoughton. Natick beat the Black Knights, 74-54, in a tournament game on December 30th. 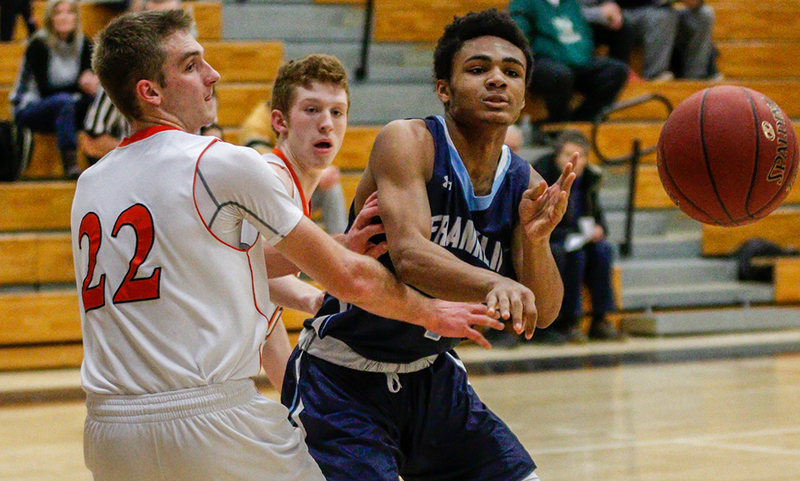 Franklin beat Stoughton, 93-58, in a Hockomock League game on January 26th. FRANKLIN, Mass. – Coming off a state finals appearance a year ago, Franklin loaded its schedule with tough opponents in hopes of preparing for another deep playoff run. After beating D1 South hopeful New Bedford on Sunday, the Panthers matched up with the state’s top-ranked team, Tech Boston, in the championship game of the Harvey Nasuti Winter Classic. Although the flow of the game was hindered by nearly 50 foul calls, the Panthers made the runs at the right times and limited the Bears in transition, resulting in a 76-67 win. Franklin sophomore Chris Edgehill scored a career-high 31 points and dished out five assists to garner the tournament’s Most Outstanding Player honor. Edgehill went 17-for-18 from the free throw line. As a team, Franklin was 31-for-48 from the charity stripe, with 37 of those attempts coming in the second half. The first quarter went back-and-forth with Tech Boston (16-1) twice building four-point leads (7-3, 11-7) but both times the Panthers came back. The latter comeback — a bucket from Jalen Samuels (13 points, 13 rebounds) on a feed from Paul Rudolph and two free throws from Edgehill — tied the game after eight minutes of play. With the score knotted 18-18 in the second quarter, the Panthers rattled off a 12-3 run over the final 3:21 of the half. Senior Paul Mahon (eight points, four assists) bookended the run with a pair of layups, Samuels had five straight points in the middle of the run and Edgehill drained a triple off a nice feed from Jack Rodgers. The run gave Franklin a 31-20 lead at the break. Tech Boston upped its pressure to start the second half, using a full court press along with some trapping. The adjustment paid off and the visitors started the third quarter with an 8-0 surge to get within one point. Franklin, however, had a response of its own. The Panthers went on a 14-0 run over the next four minutes to build the separation it needed to ride the rest of the way. Matt Elias scored the first four points, Edgehill picked up four points via two technical free throws and a layup on the ensuing possession and then Mahon had four points breaking the press as well as an assist to Edgehill in transition. By the end of the third quarter, the Panthers had a 55-38 lead on the previously unbeaten Bears. The Panthers didn’t have much of a chance to run their offense in the fourth quarter. Whether it was being fouled on defensive rebounds or trying to break the press, Franklin went to the line 28 times in the fourth quarter alone, sinking 16 attempts. 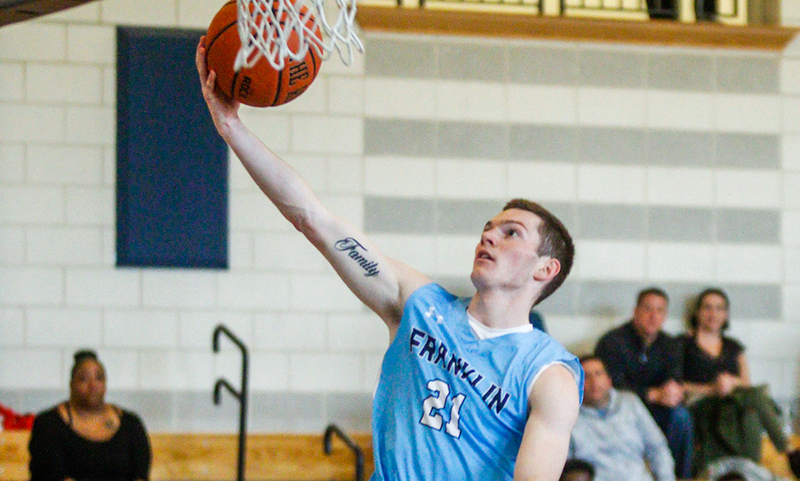 Franklin boys basketball (19-2) is back in action on Thursday when it travels to Cambridge Rindge & Latin in a rematch of last year’s D1 State Final. Tipoff is scheduled for 7:00 PM. FRANKLIN, Mass. – Having three legitimate offensive options has made Franklin one of the top teams in the area. But its now safe to say senior Matt Elias gives the Panthers a fourth. 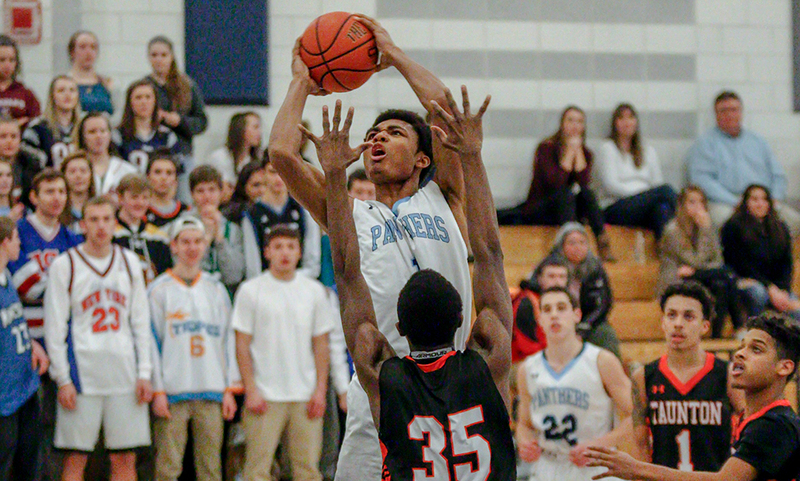 Senior Paul Mahon, junior Jalen Samuels and sophomore Chris Edgehill have been reliable options for the Panthers over the past year and a half, but Elias has elevated his game this season. The senior sharpshooter scored a career-high 17 points, connecting on four three-pointers to lead the Panthers to a key 67-52 win over Mansfield, putting the teams into a first-place tie in the Kelley-Rex. It also marked Franklin’s first win in its current gym, which opened in 2014. It wasn’t Elias’ first big scoring output of the season, but it may have been his most valuable. It seemed almost all 17 of his points either gave Franklin a big boost or halted Mansfield from gaining any momentum of its own. He drained a three just seconds after Mansfield hit their first triple, and then another just minutes later to erase Mansfield’s second — and final — lead of the game. In the third quarter, Edgehill (14 points), the team’s leading scorer entering Friday night’s game, was forced to the bench after picking up his fourth foul with four minutes to go in the frame. Although Mansfield closed the gap some, Elias hit his third three of the game to make it 45-33 and the keep the Hornets at bay. And after Mansfield was called for an offensive foul with under a minute to play, Elias beat the buzzer with a putback on the offensive end — a potential five-point swing — to keep Franklin up 47-36 going into the final period. Elias then opened the fourth quarter with his fourth triple of the night, extending the lead to 50-37. And then with five minutes to play, after Mansfield gained some momentum off of an offensive putback, Elias came down the other end and converted a traditional three-point play to make it 54-42. After a frantic first quarter, the Panthers held a 17-13 advantage. Mansfield’s offense shot 50% from the field but had seven turnovers. Things didn’t get any better for the Hornets in the second quarter either. Franklin continued its solid play on both ends of the court, going 6-for-11 from the field while Mansfield’s turnover woes continued. The Hornets had eight turnovers in the second quarter alone (15 first half total) while shooting just 2-for-13 from the floor, including 0-for-8 from downtown. The Panthers outscored Mansfield 14-7 in the quarter and took a 31-20 lead into the halftime break. While Mansfield made small runs throughout the second half, the Panthers pushed their lead to 18 by opening the second half on a 9-2 run. Samuels (18 points, six rebounds) drove to the basket for two, Mahon (six points, three rebounds) drained a three, Samuels converted at the rim again and Jack Rodgers hit a pair of free throws to make it 40-22. Mansfield got it back to single digits with a 9-2 run of its own, but Elias’ third triple put an end to that surge. When the Hornets got it back to single digits later in the fourth quarter on a drive by Sam Hyland (six points, seven rebounds), Elias’ three-point play pushed the lead back to 12. John McCoy led Mansfield with 14 points and four rebounds while Tyler Boulter and Ryan Otto (six rebounds) each had 10 points. Damani Scott finished with eight points and 10 rebounds. Franklin boys basketball (5-1 Hockomock, 8-1 overall) is back in action on Tuesday with a trip to Attleboro. Mansfield boys basketball (5-1, 7-2) will try to bounce back on Sunday against Hanover in an endowment game (won’t count towards tournament record) at 5:30. FRANKLIN, Mass. – The Franklin boys basketball team had little trouble finding its defensive identity this season, which is a big reason why the Panthers have won six of their first seven games. “I think we were just more aggressive and shared the ball,” said Franklin head coach CJ Neely. “When we play aggressive and guys look to attack the paint, and then when they get in there and make good decisions that can be the difference. The Panthers nearly doubled their score from the first half with the big quarter. After scoring 28 points on 42% shooting from the floor (10-for-24), Franklin exploded for 11 field goals (3-for-5 from three) in the third on 65% shooting with just one turnover. 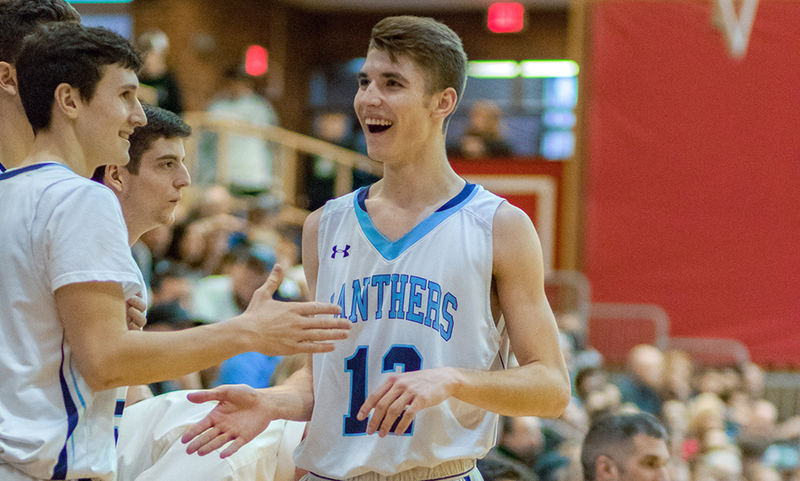 Senior captain Paul Mahon scored eight straight points for the Panthers, part of a 14-3 run that Franklin used to open the second half. Mahon splashed a three from the corner and then hit one from a couple steps beyond the line. Franklin got out on a fast break but missed, only for Mahon to come in uncontested for one easy putback and a 36-24 lead just 90 seconds into the second half. After Mahon got things started, sophomore Chris Edgehill (23 points) and junior Jalen Samuels (16 points, nine rebounds) did the rest for the Panthers in the quarter. Samuels and Edgehill scored back-to-back baskets and then Samuels followed up his own miss with an easy putback. After Taunton stopped the streak with a free throw, Edgehill drained a three after the Panthers hauled in an offensive rebound. Taunton’s Naz Kenion, who had a solid game off the bench with 11 points and six rebounds, corralled a three-point miss and scored to cut the deficit to 45-30, but Samuels added to Franklin’s second chance points with an assist from Edgehill. Samuels added two more free throws and Edgehill closed the quarter with four straight points. Franklin raced out to a 14-7 lead in the first quarter as the Tigers struggled from deep (0-for-10 from beyond the arc). In the second quarter, Taunton cut the deficit to five three separate times but couldn’t get closer. Back-to-back buckets from Lens Esquil (17 points, nine rebounds) cut it to 16-11, but Matt Elias (13 points) answered for the Panthers with a triple. Lou Vendrell splashed a three to get Taunton within 21-16, but free throws from Jack Rodgers and Elias, followed by a bucket from Samuels stretched Franklin’s lead back to 25-16. Esquil again rattled off four straight points to bring Taunton within 25-20 in the final minute of the quarter, but Elias drained another triple to give Franklin a 28-20 lead at the break. Taunton’s up-tempo trap defense paid dividends in the final quarter, forcing seven turnovers in the final frame (50% of Franklin’s turnovers). That led to 25 points in the final frame, but the Panthers never let the game get within single digits. Behind eight points from freshman Diamond Blakely (11 points total) and four points apiece from Kenion, Esquil and Malik Charles, Taunton cut it to 10 with a minute to play but that was as close as they would get. Taunton finished the game 2-for-17 from beyond the three-point line. Taunton falls to 5-4 overall with its third straight loss and 2-3 in league play. The Tigers will try to bounce back when they return to action on Friday for just their third home game of the year against King Philip. Franklin boys basketball (4-1 Hockomock, 7-1 overall) will host rival Mansfield (5-0, 7-1) in a key Kelley-Rex division showdown. Mansfield is riding a three-game win streak at Franklin, and are 2-0 in the new gym. NORTH EASTON, Mass. – Sunday night was Franklin’s first division game of the season, and likely a preview of what the Panthers will see over the next two weeks, and again later this season. Although the Panthers led from start to finish and had a double-digit for most of the second half, the win wasn’t secured until the final buzzer. Oliver Ames refused to go away, even cutting the deficit to six with two minutes to play but Franklin was money at the free throw line late, coming away with a 63-50 win over the resilient Tigers. Sophomore Chris Edgehill led the way offensively, tying a career-high with 28 points while Franklin went 11-for-12 at the free throw line over the final two minutes to secure the victory. Franklin closed the opening quarter with an 8-2 run to seize a 17-10 lead through eight minutes. The Panthers limited OA to just nine points in the second quarter, but the Tigers’ defense also kept Franklin’s offense in check (10 points), heading into half down 27-19. The Panthers’ 11-point lead in the third quarter was trimmed down to just five behind baskets from OA’s Jake Erlich (13 points) and Jack Spillane (15 points, seven rebounds, four assists). But before the Tigers could get any closer, Edgehill drained a three to spark a 13-4 run. Edgehill followed his triple with a strong take to the rim, and Paul Mahon (six points, four assists, three rebounds) had an easy take after a nice pass from Matt Elias (eight points, three rebounds). Franklin cashed in on back-to-back OA turnovers with both Edgehill and Paul Rudolph finishing traditional three-point plays. Franklin took a 43-31 lead into the final frame. The Panthers led by as much as 14 early on in the fourth, and then a triple from Edgehill with three minutes to play had Franklin leading comfortably 52-39. But once again, OA got right back into the game when Spillane hit a three while being fouled, finishing the four-point play a the line, and junior Sean O’Brien hit two free throws to make it 52-45 with two minutes to play. Jalen Samuels (12 points, four rebounds, three blocks) hit a pair of free throws to push the lead back to nine but Spillane splashed a three to make it a two-possession game. OA came up empty on its next trip, missing a pair of three’s, and Franklin iced the game with successful free throw shooting. OA junior Ethan Eckstrom finished with 13 points for the Tigers while senior guard Matt Muir was the games’ leading rebounder with eight boards. Franklin boys basketball (3-1 Hockomock, 6-1 overall) is back in action on Tuesday when it hosts Taunton. Mansfield Olver aelxi (2-2, 4-3) resumes action with its fifth straight home game, hosting King Philip at 6:30. FRANKLIN, Mass. – When the teams headed into the lockerroom for the halftime break, it looked as if the game was headed to a classic Franklin-Catholic Memorial finish that would come down to the final minutes. The third quarter started out similar to the first half as a back and forth affair. CM’s Kani Glover (seven points) opened the scoring up for the Knights, but Franklin sophomore Chris Edgehill (eight points) quickly responded with a three for the Panthers. Anthony Morales (ten points, eight rebounds) responded back with a layup off a feed from Jarrett Martin (nine points). Jack Rodgers (career-high 18 points, four rebounds, five assists) scored for Franklin down the other end, and Martin hit an athletic layup seconds later to put CM up 37-36 with 6:03 left in the third quarter. But from the 6:03 mark to the end of the third, Franklin finished with a 23-7 run that included five points apiece from Paul Rudolph (seven points off the bench) and Alex Klowan (eight points and four rebounds off the bench). At the end of the quarter, Edgehill buried a three from just inside half court as time expired to give Franklin a 13-point cushion to end the quarter. “Chris’ three was huge, you don’t see that coming, it definitely brings a huge momentum into the fourth quarter, the guys were excited in the huddle, so we were ready to go,” said Franklin head coach CJ Neely about Edgehill’s three at the end of the third. Franklin got off to a fast start as they held a 15-11 edge at the end of the first quarter. Rodgers had eight of his 18 in the first frame, while Jalen Samuels (nine points, ten rebounds) chipped in four points. Catholic Memorial came back with 20 points in the second quarter, behind six points off two threes from Will McDonnell and seven points from Jarron Flynn (team-high 15 points, five assists, five rebounds). 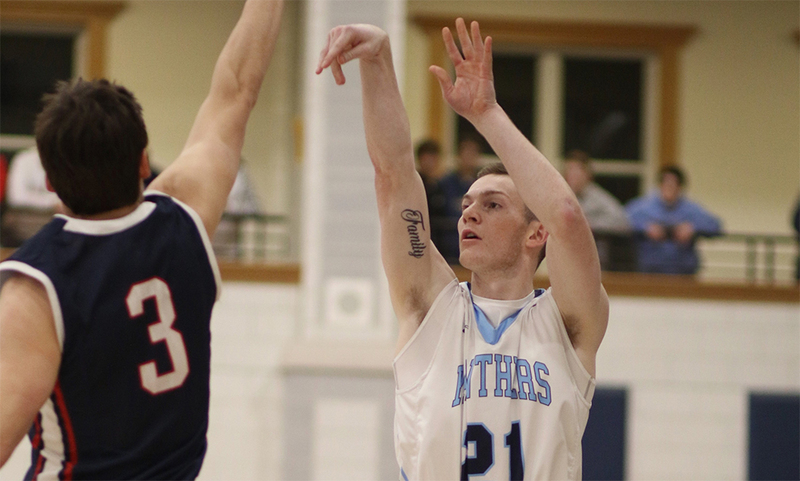 Matt Elias (14 points including four threes, five rebounds) had six points off of two threes for Franklin in the quarter. One of the keys for Franklin was their senior leadership, as 57 of their 74 points came from seniors, including 18 from Rodgers, 14 from Elias, and ten from Paul Mahon (who also contributed seven rebounds and four assists). In addition, Klowan and Rudolph brought a spark off the bench, as both played big roles in Franklin’s third-quarter run that helped them put the game away. “They’ve definitely seen CM before, so they know the deal, I think when you don’t play them you don’t get that type of refresher, they’re one of only a few teams than can press you like that and bother you, and when you haven’t seen it you get guys all over you and you can a little nervous throwing the ball around, but they knew it was coming, and we woke up this morning expecting pressure, so now they know it’s coming, they’ve seen it before, so I think it was huge to have them, and then Jalen and Chris have been in a lot of games for us in big moments, so they might as well be seniors at this point,” Neely added about Franklin’s senior leadership. Since this was an exclusion game for Franklin, it will not count toward their tournament record. The Panthers (2-1 Hockomock, 6-1 overall) are scheduled to take on Oliver Ames (4-2) in their first Kelley-Rex matchup Friday night in Easton. The Knights (3-3) will face Malden Catholic on the road on Friday Night. Franklin beat Malden Catholic 62-38 in a recent tournament game.